BHW has been supporting sewing training courses near to Faisalabad (PAK01c) since June 2013. This project is to enable the women who have been trained to sew to earn a better living for their families by sewing garments for sale. It will also provide income for two men who will sell the garments. Currently there are four sewing centres in different villages near Faisalabad. They are all slightly different but they are operating well and a number of very good sewers have emerged from the training. It was the women from the training programmes who came up with the idea of starting a clothing business and selling direct to the public. There are no clothing shops in these villages but there are people who come around selling clothing. The women from the sewing centres will be given material to cut and sew and will be paid for stitching the garments so they will have regular employment. These clothes will then be gathered together and taken out around the local communities to be sold. The purchase of a small vehicle is part of the project. There is quite a bit of day to day management required; purchase of material in Toba Tek Singh and Faisalabad markets, distributing the material around the groups, gathering the completed garments, selling the garments Monday to Saturday, paying the sewers, and receiving and receipting money from sales. BHW has had a relationship with Azam and Barbara Gill since 2002 after our Field Director met them at an international conference. 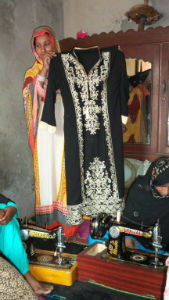 In August 2008 BHW funded a pilot sewing programme in Islamabad (PAK01) where 20 women were trained. This had an incredibly positive impact in that community as for the first time many of these women were now able to support themselves and their families. Since then a number of other sewing and adult literacy programmes have been funded, as well as support provided for the establishment of the Christian Cambridge School. Azam comes from this rural area near to Faisalabad. When visiting his family and the Christians there he started to wonder how he could help them. Because of the changes they had seen happen when women were trained to sew in Islamabad they explored the possibility of doing something similar in this rural area. In 2013 a pilot programme was commenced and since then it has become a regular programme in different villages from year to year. This was the very first time anyone had commenced any development, training or anything like a sewing centre in these villages. In March 2016 Azam presented this new business opportunity to BHW's Field Director and following further discussion, in March 2017 funds were sent for them to commence. Christian families in the four villages near Faisalabad who have had training courses operating. There are a small number of Christian families in each of these villages. They are an oppressed minority with few opportunities for development and with few assets. The Christians have so many difficulties, boundaries, restrictions and problems. This clothing business will encourage them and will give them hope and peace of mind. They envisage this business will give 15-20 ladies permanent work. It is building on top of an existing programme and providing further opportunities for income generation. The families involved are all poor families who suffer a great deal from being a Christian minority. They have people available to oversee the project who have experience in both the manufacture and selling of products in this way. Azam has been in Christian ministry since the late 1990's and is very passionate about the Good News. He is married to Barbara and they have three children, two boys and one girl. He became a follower of Jesus in 1987 and in 1991 joined Bible School in Pakistan. They are well known and have served the community for many years, especially in Rawalpindi and Islamabad. He has a heart for church planting and development and sees the benefit of providing training and education to the poor in his community. The two key people on the ground in the villages who will oversee the project are two of Azam's elder brothers, Iqbal and Ayub, aged 55 and 53. According to Azam, both are hard-working, faithful, hospitable men with supportive wives and children. As a family they had a plastic production industry initially in Karachi with 4-6 machines. Iqbal and Ayub decided to bring the business back to Faisalabad but unfortunately it did not work out. They then established the business in their village and Azam worked with them along with their father, sisters and 3-4 other people from the village. The business always did really well but for family reasons this work was stopped. Following that Ayub started selling the cloths of a man from the village and Iqbal commenced selling fruit and vegetables. They both also have animals to raise to support their families. Both of them have good experience in the markets and in surrounding areas/villages and also have good connections with customers they have had for the past 20 years. They are mature men and know how to deal with people and to sell their items. The vision is to create a small business selling clothes to generate a regular income for the Christian families in these rural villages. Profit from the business will be used to develop other projects in the area like adult literacy and more sewing training. Income will be generated in two ways. The women from the sewing centers will be given material and patterns to sew. They will be paid at a high rate for the work they do. The clothes will then be sold by two salesmen. They will move around the district with a motorised vehicle. The dream is for the families to all have regular income from the business operations.